As Office Delve continues to roll out to Office 365 business customers, we love hearing about how people are using this new, innovative experience to discover and explore content that’s relevant to the work they and their teams are doing. Using Office Graph, an intelligent fabric that applies machine learning to content and interactions occurring in Office 365, Delve helps you get back to pertinent documents, discover relevant content that has been shared with you, and search for information related to subjects you care about. Now, we are taking the next step by making it easier to organize all the valuable content that gets surfaced in Delve. We are excited to introduce a new feature in Delve called boards that help you organize content, so it’s readily accessible and easy to share with others. 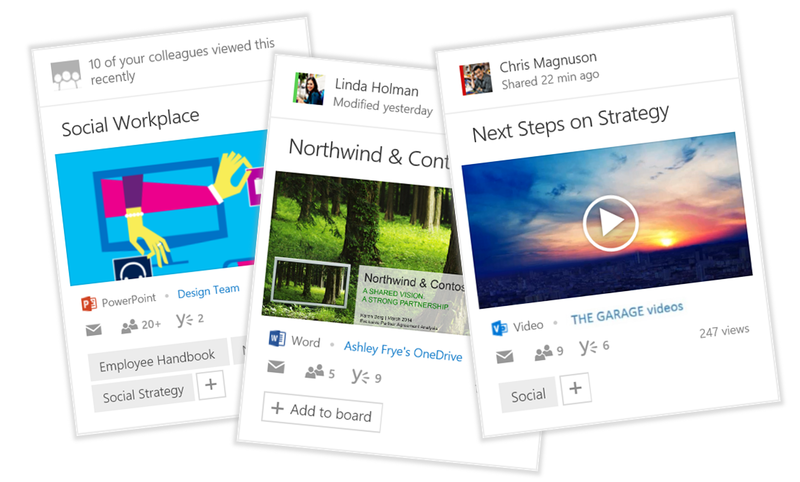 In Delve, you can use boards to group together and share related documents. For example, you can create a board to collect and organize all documents related to a specific project your team is working on. Everyone in your organization can view and contribute to an existing board or create a board—but they can only see and open documents that they have permission to access. When working with others, information tends to get scattered. And that’s OK. Organizing around ideas and topics with boards is easy and powerful. Just click + Add to board, enter a board name or pick from a list of existing boards. Any card you see in Delve can be added to a board—documents, sites, videos and more. Boards allow you to discover content related to topics and projects and make it easy to return to the content that matters most to you. From within Delve, you can search for a board, follow it to stay informed and discover other boards—all without having to know or remember where individual pieces of content live. Your boards are always at hand. Add to your boards, discover new ones or follow them to stay up-to-date. Every board is a unique collection of ideas and information that others can discover and contribute to. Just as any view within Delve, boards only surface the content you have permissions to see. 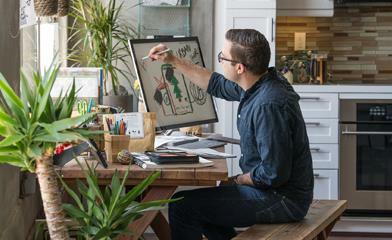 Collaborating gets easier too. You simply share the URL of a board with your team, or click Send a link directly from the board, which remains fresh as your team works on and updates those documents over time. The journey with boards starts with Delve to help you stay organized as you collaborate on documents and discover new content. Going forward, the “Add to board” functionality will serve as a basis for new content curation and knowledge management scenarios within Office 365, in line with our vision for Next Gen Portals recently outlined with the introduction of Office 365 Video. We’d love to hear from you. Please join the conversation in the Office 365 Community Network and submit your feedback on our UserVoice page. Q. Which content types are supported in Delve and can be used with boards? A. Delve surfaces relevant content based on insights delivered through Office Graph. Any content discovered in Delve can be added to boards. As Delve rolls out to Office 365 customers in the First Release program, Office Graph incorporates signals across Office 365 and content primarily from OneDrive for Business, SharePoint Online team sites and the new Office 365 Video portal. In the coming months Delve will incorporate additional signals and content including email attachments and Yammer social newsfeeds. Q. When will Delve and the new boards functionality be available in my Office 365 environment? A. 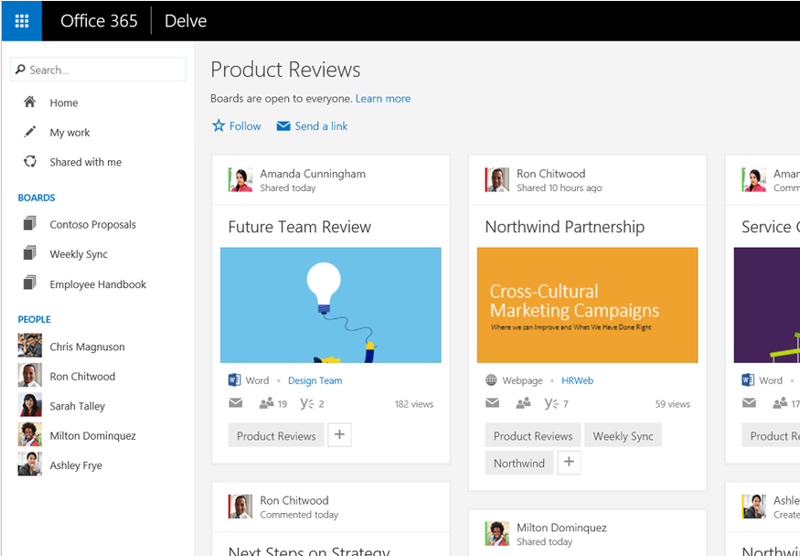 Boards will be included as part of Delve as it rolls out to customers in the Office 365 First Release program. Customers who have already opted into First Release will begin seeing the new boards functionality appear over the next few days. Beyond First Release, we expect Delve to roll out to all eligible Office 365 customers by early 2015. Q. How will boards integrate across Office 365 in the future? A. The journey with boards starts with Delve to help you curate and organize content as you collaborate and discover. Over time, boards will be integrated across other Office 365 experiences with support for new content types and will also benefit from existing SharePoint metadata management capabilities.